Dermalogica BioSurface Peel / Gee Whiskers! 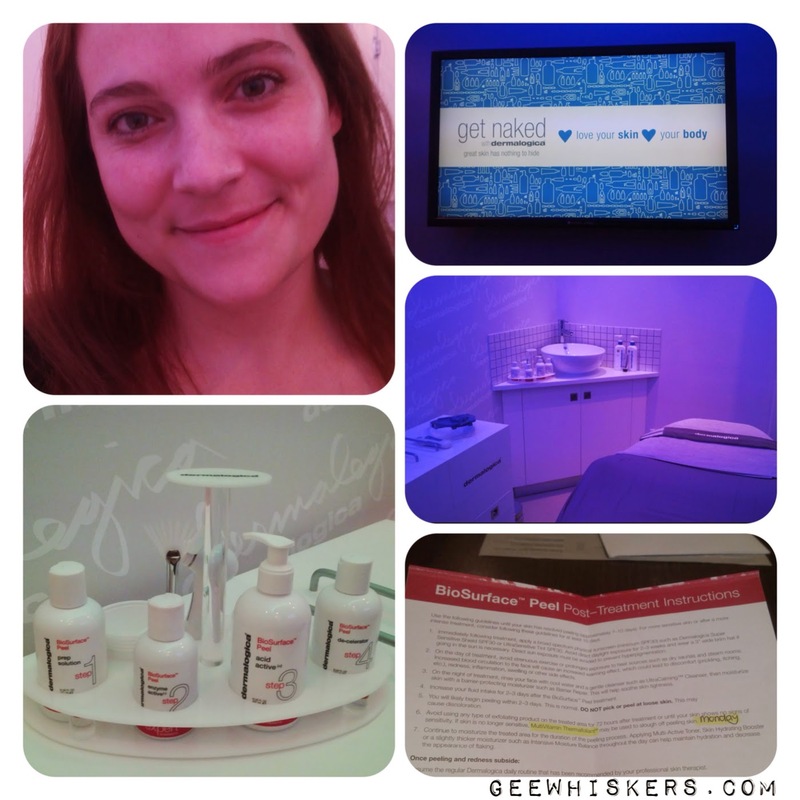 A few months ago I attended the launch of Dermalogica's BioSurface Peel and finally had my chance to try out the peel for myself. I am going to share my own experience on the peel and am therefore not going to cover everything I already covered in my first post. To familiarise yourself with the BioSurface Peel please click here to read my first post on the peel. Let's jump in! The photo I took of myself was taken immediately after the peel before I left the treatment room. Before I went for my peel I had to follow some simple steps to prepare my skin for the peel. First off, I had to make sure that I drank enough water leading up to the facial and secondly, I had to perform regular facials to ensure my skin was prepped. To help with this preparation, I went for 2 full Dermalogica treatments and thereafter I performed at home facials 2 - 3 times a week (cleanse, exfoliation, mask, serum and moisturiser). The peel is only done by skin therapists who have gone through the BioSurface Peel training. I have my favourite therapist, Catherine, at the V & A Waterfront concept store so I went straight to her for my peel. The peel starts off with a thorough cleansing of the skin and skin mapping. Thereafter a thin layer of the Prep Solution (Step 1) is applied to the skin. The solution is left on your skin for 5 minutes to allow your skin cells to absorb it. I got a nice face massage during this time. After the 5 minutes are up a layer of Enzymes (Step 2) is applied to the skin. The Enzyme Active contains enzymes which remove impaction plugs in follicles especially in sebaceous glands, and aids in cell turnover. Again one needs to wait for 5 minutes to allow your skin to absorb the enzymes. I didn't feel any tingling or burning sensations at all and enjoyed my scalp massage while the enzymes started their job. The Acid is then applied which is also done layer by layer. After each layer you again need to wait 5 minutes, during this time the therapist uses a little fan to cool your skin. Throughout the entire process of applying the acids my therapist checked with me to see if I was experiencing any discomfort or pain. If you do experience a lot of pain or discomfort the therapist will immediately apply the De-celerator to stop the process and normalise the epidermis layer. I managed to have 4 layers of acid applied to my skin with only a tiny amount of tingling which I hardly even noticed and absolutely no burning whatsoever - I promise, hand on my heart. My therapist said we'd stop at 4 layers to not over do it on my first peel (The maximum allowed layers of acid is 5). The final layer, De-celerator, stops the exfoliation process and slows the activity of the acids. It also normalises the epidermis while calming it and initiating the skin repair process. I was really surprised that my skin could handle 4 layers of acid, as was my therapist, because when you have sensitive or dehydrated skin (I have both of those) you generally will feel some sensation. I know this sounds silly, but I was really proud of my skin and how well my peel went. I walked out the store with a makeup free face with no redness or inflamed skin. I even walked around the waterfront and had supper with JP after the peel. So that really says a lot to me - there truly is no down time and no scaring. My skin feels super smooth and at the moment it does feel a bit tight. This is because the bonds between my upper layer of skin cells are breaking down to assist the peeling of the skin. Over the next 2 - 3 weeks I should expect a bit of peeling and flaking of the skin. To help minimise the visibility of this, I am using a BioSurface Peel After Care kit containing an Ultracalming Cleanser, Barrier Repair, Super Sensitive Shield SPF30, Intensive Moisture Balance moisturiser and a MultiVitamin Thermafoliant. I will do another post to update all of you on my progress and what the after effects of the peel is like. There is so much information about this peel. I didn't want to put it all in this post because it will be far too long and I know from personal experience that people don't read LONG posts. If you have any questions please post them below and I'll respond to them. You can also visit the Dermalogica website to get more information. You can get Bio Surface Peels at Dermalogica Concept Stores and also at Sorbet Salons (R690 for a treatment). To ensure maximum results, BioSurface Peel™ is recommended as a series of three to six treatments. Oh gosh you are far braver than me!!! I wasn't scared at all because this is only on the upper layer of the skin and I've seen a demo of this first hand - it's safe and easily controlled in the treatment room. Yes, works on the upper most layer of your skin. It will definitely help in minimising the appearance of surface level spots and fine lines. How bad was the peeling and when did it begin?